SABI, the South African Irrigation Institute, strives to provide better irrigation standards and norms in ensuring the optimal use of irrigation water, as a scarce natural resource. SABI has more than 450 members that include inter alia designers, engineers, soil scientists, crop experts, economists and irrigation farmers. Furthermore, there are more than 50 company members, which represent mainly manufacturers and suppliers of irrigation equipment. SABI regularly presents irrigation courses in co-operation with the private sector, universities, research organisations and agricultural colleges. Company members provide training on practical aspects of irrigation, such as installation, maintenance and management of irrigation systems. View our 2019 Irrigation Wise Academy Training Brochure below. SABI exists as an association so that all irrigation and water stakeholders who are part of SABI do better as a community than they would have done if SABI did not exist. Netafim is the global leader in smart drip and micro-irrigation solutions for a sustainable future. Since introducing the world’s first drip irrigation solutions in 1965, we have led the way by developing products that help our customers optimize results. As the world’s population continues to rise and natural resources come under pressure, more efficiency makes more sense than ever. At Netafim, we help our customers produce more yields and better crops with fewer resources. Our irrigation systems include LPS – A Low pressure-system designed for large-scale areas of so far flood-irrigated crops. The system suits crops’ local conditions (leveled areas; low pressures). For an extensive list of all our Drip, Sprinkler, Micro-Sprinkler and Complementary Products, click here. Netafim™ Greenhouse, one of the world’s leading greenhouse solution providers, has accrued vast global experience in providing highly specialized, state-of-the-art greenhouse systems, commercial greenhouses and greenhouse equipment. Our locally based teams tailor high-quality, turnkey greenhouse projects delivering comprehensive solutions for enhancing crops and managing climate control while aiding clients to adhere to their budgets and ensure a return on investment. For an extensive list of all our Greenhouse Solutions and Products, click here. At AGRIPLAS, we produce the most effective solutions to your irrigation needs from driplines, micro sprinklers, valves and filters, to sophisticated automation systems to assist the continual management of water. AGRIPLAS is the only South African manufacturer of both flat and cylindrical driplines. AGRIPLAS aims for continuous development and improvement of its products. It now has the best technology and pipe manufacturing equipment to ensure service excellence. Our products are manufactured from the toughest materials available and designed to ensure reliability and extended life-span without sacrificing easy maintenance. AGRIFARM is a dynamic and innovative South African company that focuses specifically on Water, Energy and Growth related farming matters. Innovative technology, developed and executed by highly skilled and experienced personnel. AgriFarm is the first firm concentrating on doing online business with commercial farmers in Southern, as well as the rest of Africa. Our thrust and core competency is focussed on the trilogy of Water, Energy and Growth, designing and supplying products and services that act as a management tool to enhance yield and return per hectare, while also addressing areas such as fertilizers that are more environmentally friendly and have a smaller CO2 footprint. Competitive markets in horticulture and agriculture encourage growers to seek more control on the plants’ performance and increase uniformity throughout. The ability to “feed” the plants with the exact amount of water and nutrients at the right moment has proven to be essential for harvest quality, quantity and timing. “Well tuned” irrigation systems can be an ultimate tool for the plants’ control and uniformity management. AgriFarm establishes a baseline against which conservation of water and energy can be measured. This enables the farmer to take control of the cost of water and electricity as well as growth products, and to relate this information into a yield factor per hectare – also enabling him to make more effective decisions. And the cost factor? After a 3 month trial period, a life cycle model is produced and agreed upon. A large irrigation system is a complex machine, stretched over a large area. Nevertheless, on many farms, this is exactly what people do: operating these systems with almost no feedback to tell them about the performance. 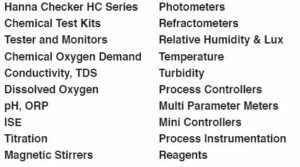 We also manufacture titrators, wine analysis instrumentation, magnetic stirrers, ion selective electrodes, pH & ORP electrodes, buffer & calibration solutions, refractometers, chemical test kits, photometers for alkalinity, aluminum, ammonia, bromine, calcium, chloride, chlorine, chromium VI, copper, cyanide, cyanuric acid, detergents, fluoride, hydrazine, iodine, iron, magnesium, manganese, molybdenum, nickel, nitrate, nitrite, nitrogen, ozone, phosphate, phosphorous, potassium, silica, silver, sulfate and zinc, as well as dosing pumps and in-line controllers. Donkerhoek Data’s software is the result of 33 years’ experience in the South African IT arena. We are an innovative and dynamic IT company and a leader in the field of specialized software for the Agricultural and Business sectors. Our capabilities include developing & supporting software as well as advanced technical and hardware services. Our products include Management Solutions – Payroll and Time Systems, Cellar Management, Farm Management Africa, Water Management – Aquacheck and Fuel Management Systems. Optional hardware to complement our products is also available.